Notes: Based on the children's book by Eiko Kadono. EDITORIAL NOTE: The American dub of this, though somewhat different in feel from the original acting, is actually fairly decent, though there is more music than the original Japanese form. (It seems American studios don't understand the meaning of silence in a movie...) The most striking difference in the American version is the voice of Jiji, Kiki's familiar, voiced by the late comedian Phil Hartman in one of his final roles. Though vastly different from the original, the American Jiji is actually just as funny as the Japanese. As far as the American subtitled edition is concerned, I have a not-too-serious gripe: why subtitle "coffee" as "hot chocolate" when it's obviously audible as "coffee"? The Japanese word takkyuubin (meaning "door-to-door courier service") is actually a trademarked term by Yamato Transport, whose delivery vans emblazoned with a logo featuring a black mother cat and kitten are ubiquitous in Japan. Given the positive image of Kiki and Jiji, Yamato Transport not only gave implicit consent to use the term takkyuubin in the title, but enthusiastically supported and promoted the movie as a sponsor. Kiki is thirteen years old, right at the age when a young witch in training is supposed to travel to another city and strike out for herself. It's a real test of responsibility and independence, and if Kiki can handle it for a year, she'll be ready to undergo the rest of her education. So, with only a little money, her pet cat / confidante Jiji, and her mother's broom, Kiki makes her way to a big city by the sea, where witches haven't been seen for years and the demand for them isn't exactly great. Being resourceful, Kiki starts the kind of business most suitable for a witch who can fly on a broom: an airborne package delivery service. As her fledgling business becomes more and more successful, she meets various friends who each teach her about independence, inspiration, and what to do on days when both seem to vanish. And yet another classic by anime great Miyazaki Hayao. While Kiki's Delivery Service may not be as action-packed as Castle in the Sky or as grandiose as Nausicaa, Kiki's Delivery Service still manages to provide something for everyone. It's a charming little slice of life with a healthy sprinkle of that ol' Miyazaki magic. The artwork and animation, as would be expected in any Studio Ghibli production, is top-notch with wonderful attention to detail. The flying sequences are excellent, giving you a real sense of what it might be like if you could actually fly on a broom. Most interesting is Miyazaki's portrayal of the setting: the movie incorporates numerous elements and anachronisms to achieve an overall feeling that this movie could take place anywhere, anytime. Fifties fashions walk side by side with trendy 80's clothes, and the radios have stations that are broadcast in English, Italian, Japanese. 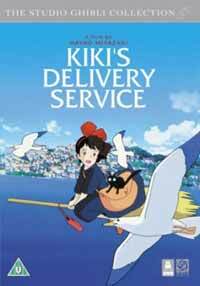 As for the story, Kiki's Delivery Service is another example of a movie where the plotline takes back seat to character development, much in the style of Whisper of the Heart and Porco Rosso. Instead of a swashbuckling tale of rescue and adventure, we get treated to a precious glimpse into the life of a young girl learning about self-worth and how to cope with the dips in everyday life. And like all other Miyazaki girls, Kiki is a girl you can really root for, possessing the innocence and charm of a child who hasn't yet lost his / her idealistic views of the world. Very nice. If you're in the mood for a lighthearted anime that still has some substance to it, Kiki's Delivery Service will go over nicely, I think. Of course, if you're one of those types that only likes violence, blood, and Gainax Bounce (tm), then seeing this anime (indeed, even visiting this very review page) will waste your time.